An attractive circa 1920s solid oak drop leaf table, featuring four turned legs with cross stretchers below. All of these joints are pegged in the traditional methods. The table top turns, enabling the leaves of the table top to be supported. 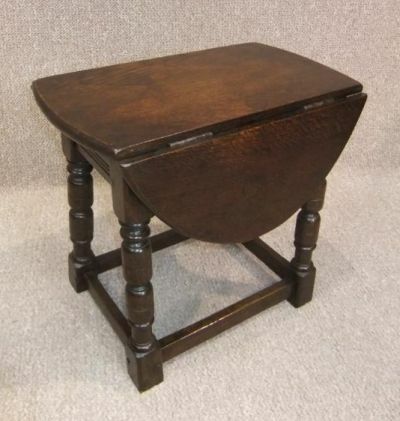 This 1920s drop leaf table is an extremely useful and sturdy piece of furniture, and in lovely condition; apart from old water marks to top (clearly shown in the photographs provided). When both leaves open: 25"